It’s not uncommon of a tennis player to struggle with the temperatures rising during long matches. On Wednesday though, it escalated on to a different level as Spain’s Nicola Kuhn collapsed midway during his first-round match against Mischa Zverev of Germany at the Miami Open. 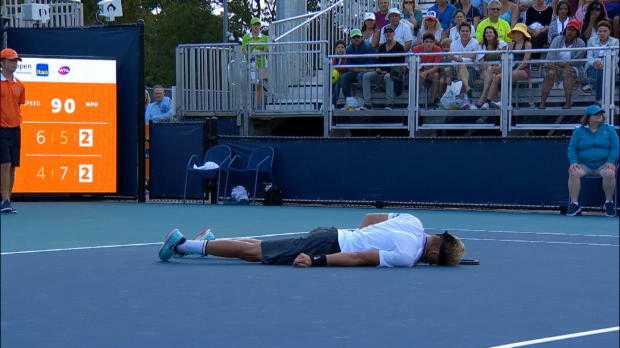 Two hours and seven minutes into the contest – with the scores reading 6-4 5-7 2-2 – Kuhn had perhaps given up on his fight with cramps as he fell on the ground midway during a rally. He struggled to turn his body, writhing in pain for a few seconds, before a physio turned up. No wonder, he had to pull out of the match. Kuhn, who turned 19 on the day, later took to his official Twitter handle to share a message. “Left everything on track. The birthday was not as I wanted but very grateful for all the support received today @MiamiOpen,” he wrote. Kuhn’s fellow tennis players were quick to show some support. “That’s tough to watch. Hope you’re well, my friend,” Felix Auger Aliassime wrote. As for the 75th ranked Zverev, he is scheduled to lock horns with world No. 19 Nikoloz Basilashvili of Georgia on Friday.